The "Yacht Express" pulled into Ft. Lauderdale Oct 24, 2011, with a record breaking cargo of yachts valued collectively at $270,341,000. The ship claimed its berth at Port Everglades and began the de-ballasting process that allowed sea water to flood its dock bay and 19 state-of-the-art luxury yachts to safely motor out the back. The largest of the vessels was the 190’ (57.91 meter) super yacht "Mi Sueno", which loaded on Yacht Express in Genova on October 6. It had just returned from the Monaco Yacht Show and will be attending the Fort Lauderdale International Boat Show, which starts October 27. Several of the yachts on the "Yacht Express" have shipped with DYT multiple times, including the 163’ (49.70 meter) "Casino Royale", the 160’ (48.78 meter) "Odessa" (four times each), the 161’ (49.09 meter) "Zoom Zoom Zoom" (seven times), and the 132 foot (40.24 meter) motor yacht "Miss Rose". The "Yacht Express" provides yacht owners with complimentary cabins for crew who accompany their yachts on the voyage. 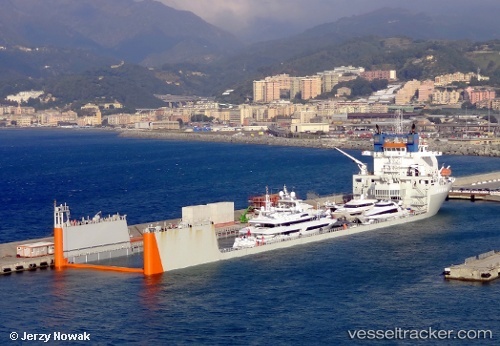 Docwise Yacht Transport has three more float-on/float-off voyages coming from the Mediterranean before year’s end, including one aboard the "Super Servant 4", which will arrive in Ft. Lauderdale Oct 28 from Palma de Mallorca, fully loaded with 24 super yachts totaling a value $190,000,000. Some of the yachts will offload in Port Everglades; then the ship will proceed to Newport, R.I., where it will once again fully load with 43 sailing and motor yachts bound for St. Thomas, USVI in time for the Caribbean sailing season. The total value of that cargo is approximately $70,000,000.